Jack Cutter (The Dragon) comes from a long line of vampire hunters. When he was just a kid, vampires attacked his family farmhouse. The Cutter family has a sacred book all about vampires and how to combat them. His family tells him "don't trust anyone", and he is sent off to be on his own. In 1995, now an adult, Cutter has tracked and killed every vampire in existence - except an elite underground club of nine multiracial vamps, led by the sinister Brit Bruno (Guest). Cutter teams up with Raimy Baker (Smith), a reporter for the "National Inquisitor". But can he get over his deep-seated trust issues? Can he avoid the cops and exterminate the last vampires on earth before the solar eclipse when they will gain maximum power? Will Jack live up to his nickname of "The Hunter"? 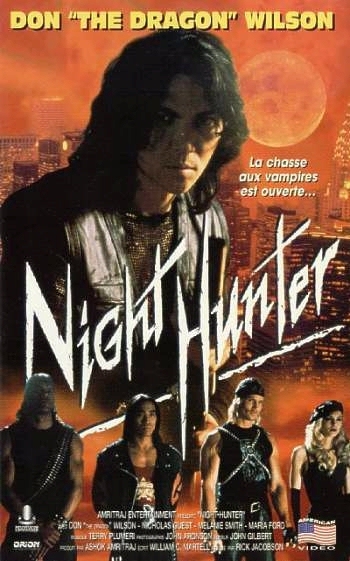 Night Hunter is a Ring of Fire (1991) reunion of sorts, as Don The Dragon, Maria Ford, Ron Yuan and Vince Murdocco all return in front of the camera, and Rick Jacobson and Art Camacho behind it. However, there seems to have been a conscious effort to do something totally different and not repeat themselves. They succeeded in that, and it is a nice novelty to see Don in a different kind of role: a dark, horror-tinged storyline instead of a sunny, romantic one like Ring of Fire. Two sides of a coin I guess. Maria Ford is always welcome, and Melanie Smith will be instantly recognized by Seinfeld fans as Jerry's girlfriend in a story arc on that show. 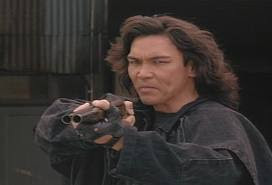 Don doesn't say anything until 20 minutes into the movie, and his character and dress are very clearly influenced by The Crow (1994) and Brandon Lee. It's also one of the better Don performances we've seen, as his wooden delivery is hidden well by a character that doesn't talk much anyway. As this is a Corman production, and he is known for "borrowing" ideas popular at that time, the film also borrows the flamenco music of Desperado (1995) and some ideas from From Dusk Til Dawn (1996). Interestingly it predates Blade (1998) in the fact that it has Vampire POV and Ford's character is similar to Traci Lords'. You've heard of "shaky cam" but during the fight scenes, they seem to have initiated something we called "earthquake cam". The screen violently shakes, so much so you begin to feel ill. The attempt to be stylish is somewhat appreciated, but you can't sicken your audience by sticking the camera in one of those paint-shaking machines at the hardware store and not expect a reaction. If this was done to cover up the moves of the actors, there's no need for that as Don's moves are excellent. They really should have reined in the earthquake cam. And sometimes they added a strobe light on top of it! 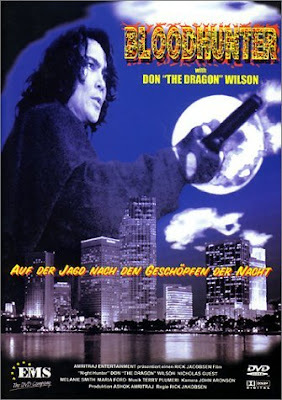 For a Don The Dragon movie with more of a professional sheen, and featuring Don in an unorthodox role, by all means try Night Hunter...but beware the earthquake cam. Hmm... okay you've sold me. This has sat in the $2 bins at my local seller of crap movies for a month now and I have always put it back down. Guess I'll pick it up now! Cool! If you like Don "The Dragon", it is a good pick up. Just the shaky cam was damn annoying at times.